Hollywood star Harrison Gilbertson says his role in ‘Fallen’ is a career changer for him. 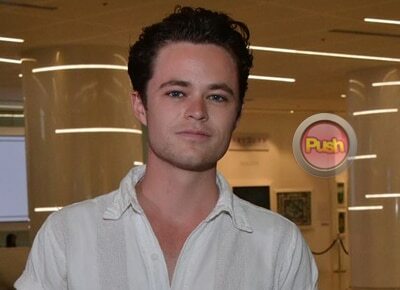 Australian-born Hollywood actor Harrison Gilbertson is now in the Philippines for the first time together with the bestselling young adult novelist Lauren Kate to promote the world premiere of the movie adaptation of the book Fallen. The 23-year-old Harrison was first known for Need for Speed where he played the role of Pete and My Mistress where he played Charlie Boyd. In Fallen, he plays the role of Cameron Briel. In an interview with Harrison at the press conference of movie Fallen at the Conrad hotel, the young actor shared his excitement about his first visit to Manila. "I'm just very curious about the country, very happy and I'm blessed to be here and I really want to explore the city as well as the food especially trying out balut." Harrison said he was lucky enough to have supporters including Filipino fans who have been following his career from the beginning. He was also thankful to Lauren for writing Fallen. "The chance to play somebody so eternal in a story is really exciting for me. While having the great platform and a lot of back story [is a] plus, having a good writer is something that I'm really excited about." He also admitted that playing the role of Cameron Briel in Fallen is a career-changing experience.